Call it serendipity or a twist of fate – but when I got the email, I was traveling. I was on a beautiful five-day tour exploring Italy’s stunning Amalfi Coast. And I was not supposed to be checking my email. That was one of the rules my husband and I had agreed upon as we took this little kid-free trip to celebrate a momentous occasion in our lives: our 10th wedding anniversary. The email I opened was from an independent filmmaker; a Brazilian expat living in France. She had read the interview I had given on Global Living Magazine on my expat life and pitched my story to the Oprah Winfrey Network (OWN) to be included in their Soulful Sunday series. (Note to others: you never know who is reading your words out there, so make them count!) 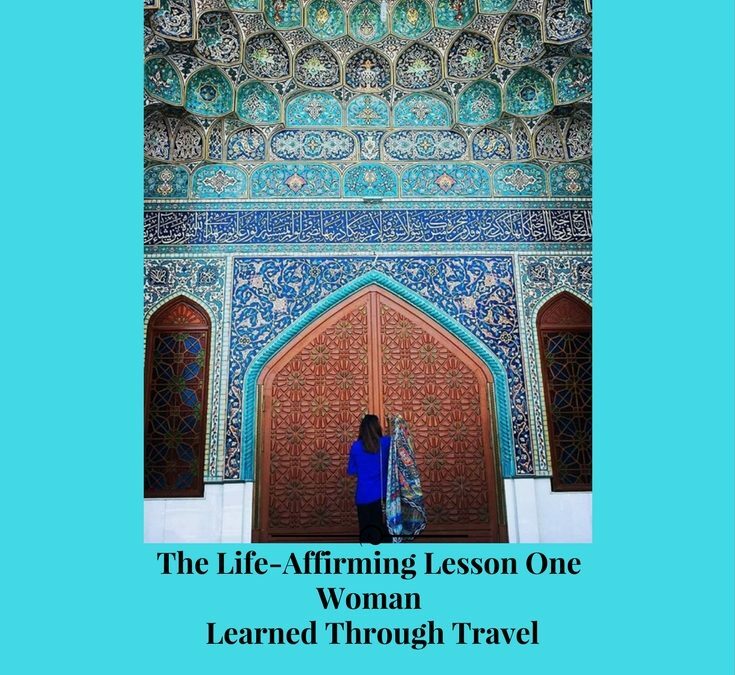 The folks at OWN loved my story and wanted to feature it to inspire people to move out of their comfort zones, to go live abroad, to see the world, to travel and to revel in all the diversity and beauty around us. I was extremely excited to share my message with a global audience on Oprah.com and said yes to filming for two days in Dubai. The filming was scheduled for August 2016, as soon as I got back from my summer vacation. In between settling in my kids at their school amidst all the back to school craziness, I took out time to share my global stories with the filmmaker for this project who flew out from Paris to talk to me. I provided photos of my childhood in Bahrain and New York City, pictures of my grandparents and extended family in Pakistan and tales from my expat adventures in the UK, Germany, Denmark and Singapore. I was filmed on my couch in my living room in Dubai, talking about it all and telling my story, in my words. I was also filmed roaming through the streets of Dubai doing the typical everyday things – the school run combined with visits to Old Dubai to get some candid shots of me in my environment. Months of post-production followed and I was shown several versions of the video by the filmmaker. I loved them all, but late in 2016 I got an email saying all the versions (which were about 4-5 minutes) were deemed too long and the video had to be cut short. Without giving me a clear indication or a clear chance, the producers and the filmmakers agreed on getting a voice over done on my video to cut it down to two minutes. Imagine my shock and surprise when I see my video on Oprah.com but it’s not my voice telling my story, its someone else’s. I can assure you I do know how to pronounce my own name! So, when you watch this video, please remember this is NOT my voice, even though it is my story. Well mostly. A few corrections: I did not move to Berlin to study; I moved to Berlin to join my husband there after our marriage. I also grew up in Bahrain and New York City before moving back to Pakistan with my family and it was this early experience of an expat childhood that filled my soul with wanderlust and a desire for adventure. In addition, every mention of my blog was taken out, even though I spoke extensively about ‘And Then We Moved To’ as the writing place that was born out of these global experiences. Without it, my story seemed incomplete. I was surprised and disappointed when I saw the final video (shortened and not my voice) that the network released in February this year on the OWN YouTube channel and on Oprah.com in May 2017. I spent months trying to see if it could be changed, but to no avail. Through this difficult experience, I learned something positive, which has prompted me to share this blog post with all of you today. First, I asked myself ‘What Would Oprah Do’ (WWOD) if this had happened to her, when she was starting out? There is power in sharing our stories. Global storytelling is a powerful tool that helps us connect and relate to each other through our experiences. The Oprah Winfrey Network did a condensed two-minute video based on my expat life and travel adventures around the world, which is a quick introduction into my story and for this I am grateful. It is extremely cool to have my life story featured on Oprah.com and I hope it will help me spread my message. But my Oprah story is just a small part of my BIGGER story. And I still own the rights to my full story. This is why I have included the video clip in this blog post: it gives you a little glimpse into my world, but it’s still up to me to fill in the rest of the blanks. For instance, I would like the narrative to include the sobering fact that international travel as a Pakistani, on a Pakistani passport was not always easy or hassle free. I have applied for so many visas to go see the places I dreamed of but each time the process was worth the paperwork, when I got to experience a new country, a different culture or learn a new language. The good things in life are never easy – you have to work hard for them. Moving to new countries is harder than it looks. Not because of all the packing and unpacking you have to do but because each new move shapes you so profoundly and you are never the same person again. Each move involves acknowledging a loss and a gain. Loss of friendships and favorite places perhaps but gaining a new understanding of a new part of the world or learning a new language in return. Expat life is deeply emotional, heart-wrenchingly difficult and there are days when you question it all. But these are countered by the magical moments of seeing your children interact with their new surroundings, picking up new skills, new words and an expanded worldview. Expat life is not one-dimensional – it requires one to be brave, oh so brave to leave behind everything you know. And yet it requires you to be grateful because you realize that there are so many others who are forced to move or flee from their home countries – refugees, asylum seekers and people fleeing persecution and here you are – holding an economy ticket to Singapore. It gives you this ingrained sense of empathy for anyone on the move, so when you see a news story on BBC about people losing their homes, you weep for them and with them. What this experience made me realize is that human empathy is at the core of change. Our modern world tries to highlight our differences and shut us out from one another, but telling our stories, unlocks that empathy and touches our souls. My Oprah video is not perfect. But my expat life is not perfect. This video highlights the responsibility we all have, to live our stories with authenticity and inside of our truths and beliefs. I was so disappointed the video was ultimately cut short and done with someone else telling my story, that I did not want to share it with anyone. But I realize we all need to own our stories and be as authentic and stay true to ourselves. That’s what truly counts in the end. So, I’m sharing this video in a way that my moral compass allows – with full disclosure, honesty and vulnerability. Your support means a LOT to me. I created my blog ‘And Then We Moved To’ to show how living a life without fear can be so rewarding. Living in 7 countries, over the past 16 years and traveling all over the world to more than 50 countries, has taught me several valuable lessons but the most important one is this: our world is a beautiful place and we are all more similar than we think. Let’s interact with one another and let’s learn from our global experiences. That’s the only way I know how. That’s the only way that makes sense. Let’s be grateful even when things don’t work out how we thought they would. As a writer and a blogger, I know I need a thick skin to succeed in this industry. Ever the optimist, I have learned from this experience and hey, if Ellen DeGeneres wants to interview me, I will say ‘yes’ 😉 This experience highlighted for me the fact that high mobility people carry a certain sense of vulnerability with them. I want to use this opportunity to tell more stories in the future – stories that allow us to connect and relate to one another. With several projects scheduled for the coming year, I hope to engage in a meaningful dialogue about what it means to constantly cross cultures and raise children in an international, cross-cultural environment. I will continue to use my unique voice and my global experiences to fight and speak up for the things I believe in; diversity, tolerance and a multicultural, interconnected world. A world where we embrace our differences, and are not afraid of them. A world where we open ourselves to understanding each other, instead of being afraid of each other. A world where we each get to tell our stories – in our own words. To stay connected, you can sign up to ‘And Then We Moved To’ with your name and email here. To stay inspired, you can follow all the latest on our Facebook, Instagram and Twitter. Oprah calling! How cool is that. Thank you for sharing your remarkable story, the entire story, and giving us lessons we can use in our lives. Thank you Stephanie! Thanks for your incredible support and I truly hope these lessons will help all of us in life, no matter where we are or what we are doing. What a great story! I love how you talk about the importance of Global Storytelling. It is so important to live and authentic life and share stories from within. Thank you for opening yourself up and sharing who you are. Thanks Claudia! This experience truly did highlight for me the importance of global storytelling. Happy to hear this article and story resonated with you! Love this post. Love the fact you were on Oprah but the post that has come of your experience is so much better than being on Oprah! Brilliant reflection and insight. So true! Thank you Ingrid! Your comment has truly made my day 🙂 I am so happy to hear that you enjoyed the blog post as it was an attempt for me to re-frame the discussion and take back control over my narrative. Its never easy admitting our failures or mistakes is it, but I think the universal truths that have come out of this whole experience is a lot better than just the video too. Thank you so much for reading! Thank you Amel! So happy to hear this was an inspiring read 🙂 Yes, that quote my Michael Hyatt really helped to shift my perspective and start focusing on the positives in this experience! Really, really well done! I AM proud of you! Thank you so much! Thanks for your never-ending support and encouragement!! Really well done babe. I was extremely dissapointed not to hear you telling your story but love how you took the opportunity to learn and gracefully position what happened. I love your blog post and this is who you are. The video is a snapshot og something that would be great to see in more detail. I like the video, too, although it is not your voice. A job well done Mariam! It’s really heartening to see how your turned it around in a very positive manner. Hope others can benefit from your experience . I absolutely loved the video minus the voiceover! Wow! Am so proud of you 🙂 stay blessed and keep inspiring! You’ve managed navigate a big disappointment with grace. I would love to see one of the longer (4-5 minute) versions of your story. Is there any chance the filmmaker could publish an “extended version” somewhere?